Most of us know that skimping on sleep wears down your body in so many ways. The power of sleep should not be underestimated and if you are not getting enough sleep you will know that it can have a detrimental impact on your ability to concentrate, to learn new skills or at least complete a full a day in the office! All this is bad enough without piiling on the results of a recent study published in Psychological Science which found that sleep deprivation is actually linked to false memories. Among the 193 people tested, those who got 5 or fewer hours of sleep for just ONE night were significantly more likely to say they'd seen a news video when actually they hadn't. The authors of this study also noted that false memories in the form of eyewitness misidentifications are thought to be the number one cause of wrongful convictions in the USA. Clearly the consequences of sleep deprivation are far reaching! This study also discovered that students were more prone to the researchers' false suggestions when they hadn't slept more than 5 hours. The authors of the study suggest that this is due to the fact that sleep deprivation leads to problems encoding new information. So if you are looking to embark on learning something new, to be able to give a reliable account of something that happened or even look after your own health at the very least, make sure you are getting at LEAST 5 hours of sleep every night. If you have trouble getting to sleep or if you suffer with distrubed sleep in the night, having a course of hypnotherapy could help you improve both the quality and quantity of your sleep. Find out how by calling Christy on 07527 567245 or email: christy@christyhypnotherapy.com. I am often asked by prospective clients who have never experienced hypnosis before, "what is the difference between hypnosis and meditation?". There is no simple answer to this question as there are actually many different types of meditation and so it is used for a variety of reasons, in the same way that hypnosis is used to help people in a number of ways. Firstly, there are actually some similarities between hypnosis and meditation. They are both used very often for relaxation and both can reduce heart rate, blood pressure and the amount of stress hormones in the body. Another similarity is that both states involve brain waves changing from the alert state (beta waves) down to alpha brain waves, which indicate deep relaxation. Neither however take brain waves down to full delta brain waves, which is when we are asleep. Another similarity is that both hypnosis and mediatation also usually begin with some form of deep breathing and/or muscle relaxation exercise in order to relax the body and begin to quieten the mind. The main difference between hypnosis and meditation is the outcome which is desired in many ways. Meditation is usually practiced with the intention of 'clearing' the mind completely from thought and the focus of meditation is the absence of any kind of stimulus. Hypnosis in contrast is usually focused on directing a person's thought toward a specific thing. So for example, when hypnosis is used to help people stop smoking, the focus will be on directing the person to think about all the bad consequences of smoking and/or how their life will be better as a non-smoker. Hypnosis can be used for general stress reduction/relaxation however even then, it will be more intentional and directive than meditation and involves accessing the unconscious part of the mind to bring forth certain bits of information that will be useful to the person in the present moment. In summary, both hypnosis and meditation are excellent ways to access the mind's ability to overcome stress and be calm. 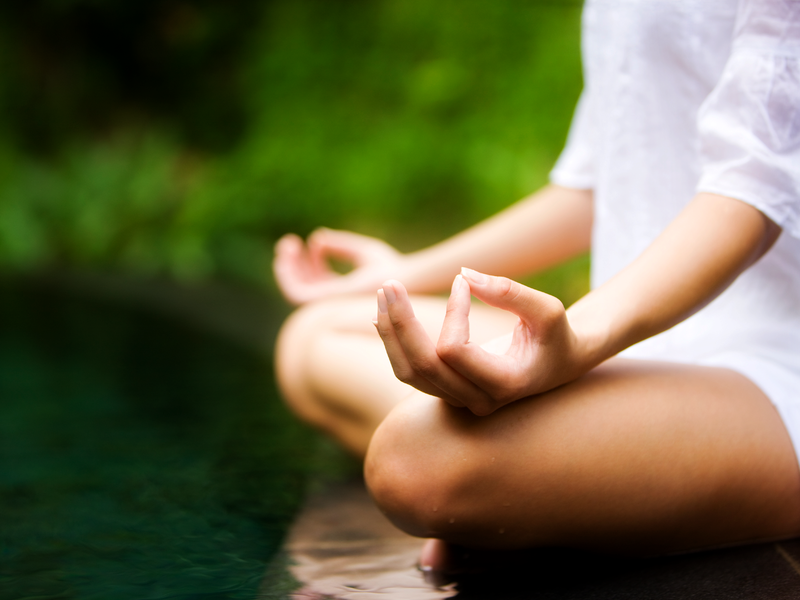 However the difference is that meditation is generally used as a form of 'downtime' for the mind where it can be totally free from conscious thought, whereas hypnosis is used to change a specific behaviour pattern, whether it be over-eating, smoking or even having a phobic response to something. Hypnosis is therefore used more as a form of 'correction' or making a positive change in a person's life.